Governor Tom Wolf has ordered all United States and Commonwealth flags to fly at half-staff at the Capitol Complex and at all Commonwealth facilities in honor of Air Force Staff Sgt. Dylan Elchin of Hookstown, Beaver County. Governor Tom Wolf has ordered the Commonwealth flags to fly at half-staff at the Capitol Complex and at all Commonwealth facilities in Monroe County in honor of Michael Tripus of Stroudsburg, Monroe County. 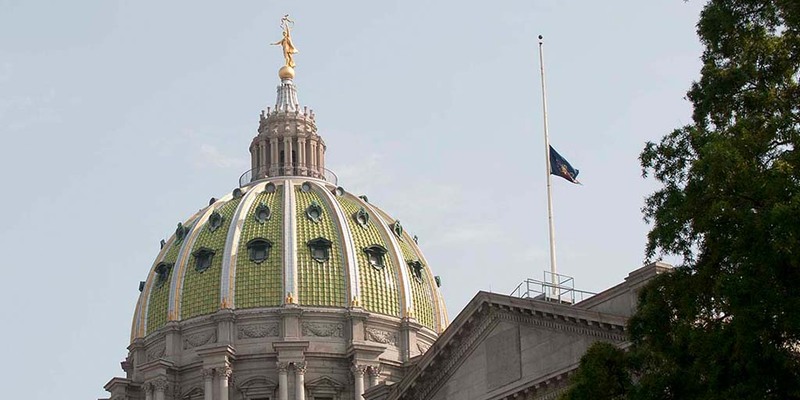 Governor Tom Wolf has ordered all commonwealth flags on the Capitol Complex, at Commonwealth facilities, and throughout the state lowered to half-staff, effective immediately. Governor Wolf has ordered all commonwealth flags on the Capitol Complex, at commonwealth facilities, and throughout the state lowered to half-staff, effective immediately, in honor of all victims of the attack at the Tree of Life Synagogue in Pittsburgh. Governor Wolf and Inspector General Bruce Beemer mourned the passing of longtime Pennsylvania prosecutor and victim advocate Laura Ditka, who passed suddenly yesterday.